The OIE (World Animal Health Information and Analysis Department) is now publishing a weekly report presenting an overview of the ASF events with ongoing outbreaks notified through the OIE's Early Warning System by its Members. A classification of the affected population (by backyard swine, farm swine and wild boar) was made considering their different roles in the epidemiology of the disease. The weekly reports can be downloaded here. This material can be downloaded and spread around from a One Drive folder and also from https://trello.com/b/GloiZoik/african-swine-fever-oie. - An 8 page-long leaflet of the Wallonie region "La peste porcine africaine: agissons ensemble!" And a number of documents intended to 1/ inform travelers about the portability of the ASP virus to contaminated food; 2/ educate farmers about the portability of the ASP virus; 3/ inform hunters and hunters about the portability of the ASP virus. Please download the package here. - Three posters titled “La bioseguridad es tu responsabilidad” (“Biosecurity is your responsability”) dealing with specific biosecurity measures to be applied by workers in pig holdings, transport and abattoirs in order to prevent outbreaks of ASF. - A poster titled “¡No nos pongas en riesgo!” (“Don’t put us at risk!”) which aims to increase awareness of travellers who arrive in Spain or fly to affected countries. 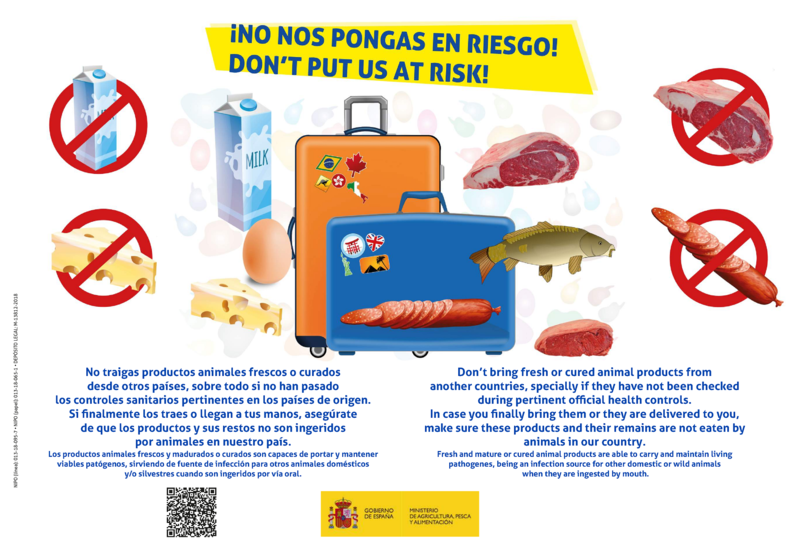 - A poster titled “Información sanitaria importante” (“Relevant health information”) with similar information to the one found in the posters designed for the airports, recommending travellers not to bring fresh or cured meat-products from affected countries and be careful about their disposal. This poster contains the same information written in six strategic languages: Spanish, English, Romanian, Bulgarian, Polish and Moroccan. - A poster titled “Si cazas en otros países debes tomar ciertas precauciones para no traer enfermedades animales a tu regreso” (“If you go hunting to other countries you must take care about not bringing animal diseases on your return”) which summarizes some important measures to be taken by hunters to prevent the entrance of animal diseases to Spain (including ASF). - A multilingual poster ‘ Don´t throw leftovers in nature, use the garbage bins!' has been posted at resting points along major roads mainly in southern Sweden and posted at all Customs offices and BIPs. - Video for travelers that for example addresses the importance of not to bring meat or meat products from pigs or wild boar from countries where ASF is present. - Questions and answers are continuously updated when the situation demands. - The website of the SBA is continuously updated. An ASF-website in English has been launched. - A series of videos from a seminar is on our Youtube channel with the NGOs in the pig branch as well as farmers organizations, hunters organizations and all governmental boards that are involved in the control and eradication of ASF in an outbreak. Editable generic leaflets (PPT files), downloadable in Bosnian, English and Serbian. Please note that this Handbook is to be considered a living document. It will be updated as often as necessary.